Cameras have now become a part and parcel of our day-to-day lives. 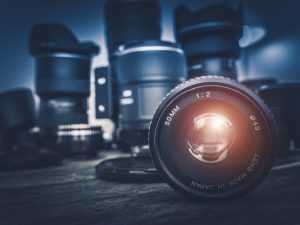 The advent of digital cameras and more so the spread of smartphones to every nook and corner of the world which are fitted with cameras of different resolutions has revolutionized photography. It is used for taking photos, consists of a closed box, which contains a sensitized plate or a film on which the picture formation takes place when light enters the box through a lens or a hole. In general terms, the camera is a dark room that has a hole. This hole allows the light to come into the dark room. The light enters the hole in a straight line and gets projected on the wall of the dark room. When taking photos, photographers want to control the amount of light coming into the camera and want to use a sharply focused image. A lens is mounted or placed in front of the camera hole. As part of the design, a lens manufacturer can have one or a series of lenses to make it work. The lens helps us to control the light entering the camera. It focuses the light on a specific area within the dark room. To capture the image of this light falling on the surface of the camera, we insert a medium that is sensitive to light. In the past, this used to be the film, but a digital sensor is used in most modern cameras. The light coming into the lens thus falls on the medium and we save it. Now that we are able to focus light on the medium more accurately, we need to have more control on the light. For that let us look at how the human eye looks. During daytime when there is bright light around us, the iris muscle of our eye constricts to prevent excessive light from entering our eyes. At night during low light conditions, the iris expands to allow more light to come in for better visibility. An aperture is an opening through which light enters and travels in a camera. It needs to be able to contract and expand to allow less or more light to enter. A shutter is used to regulate the light falling on the medium. Inside the camera is a mirror that is placed in front of the medium. When we press the button to take a photo, the mirror flips up to allow light to travel towards the medium and a photo is taken.